Come join us for some relaxation and golf at the popular 5-star Sueno Golf Resort, a real favourite for UK golfers. We can look forward to staying on an all-inclusive basis, and with 5 rounds of golf included (and free buggies) it truly is a golfer’s delight! The popular 5-star Sueno Golf Resort is a well-established favourite with UK golfers visiting Turkey, and will provide an excellent base for our golf week. 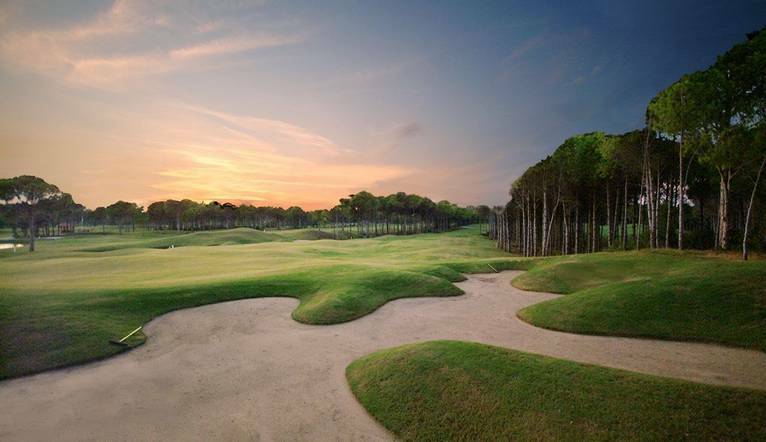 It’s the only golf hotel in Turkey with two 18-hole courses on site, so you can simply walk out of the hotel and straight onto the resort's two highly rated golf courses: the Pines and the Dunes. Together, these will provide an excellent venue for our sociable golf week of organised mixed team competitions. Located at the heart of the resort’s two golf courses and just a short distance from the beach, the Sueno’s wonderful location allows you plenty of time to relax inbetween the golf, and enjoy its excellent facilities. It’s one of Belek’s smaller hotels, with 174 rooms, which gives a more intimate feel and with most of the public rooms and sun terraces having a view of the golf courses, there are plenty of opportunities to sit back and enjoy the capers of other golfers once you have finished your own round. Facilities include a bar, restaurant, fitness suites, spa and both an indoor and outdoor pool. The rooms are spacious and attractively furnished, and feature air-conditioning, TV, safe, Wi-Fi, hairdryer, and balcony or terrace. Complimentary Wi-Fi is available throughout the hotel.